The Viaje Juntos 2018 is the fourth installment in Viaje’s series of collaborative cigars. 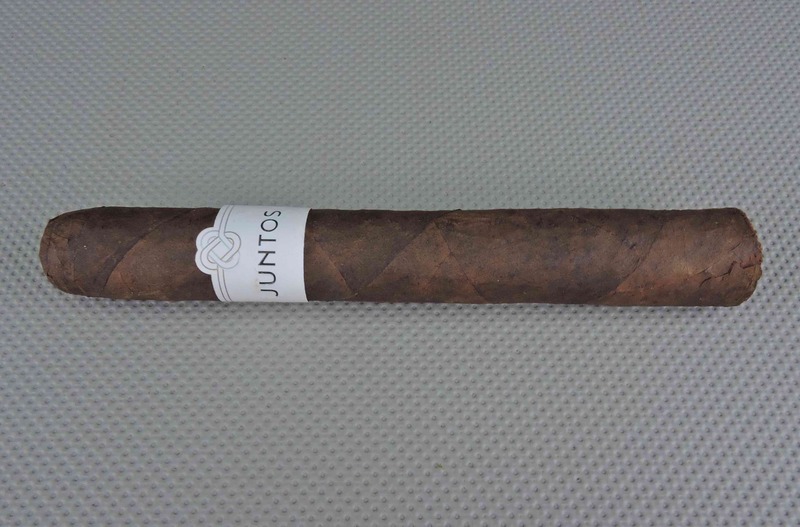 Launched in 2014, the line was originally called the Viaje Collaboration series for the first two installments, but due to trademark issues, the series was rebranded as Viaje Juntos in 2016 for the third release. The name “Juntos” means “together” and it keeps to the spirit of the original intent of the collaboration concept. For the 2018 edition of the Juntos, Viaje turned to Ernesto Perez-Carrillo Jr. of E.P. Carrillo and Tabacalera La Alianza to work on the project. Today we take a closer look at the Viaje Juntos 2018 in the Toro size. Juntos 2016 marked the first time Viaje worked with the Quesada Cigars Factory. With Juntos 2018, this was not the case. In 2017, Viaje partnered with Tabacalera La Alianza for the Viaje Piña. While Piña technically wasn’t part of the Juntos/Collaboration series, it still was a collaborative effort. During the time the Piña was being worked on, Viaje founder Andre Farkas and Perez-Carrillo Jr. came up with a second blend that they really liked. That blend would end up being used for the Juntos 2018. 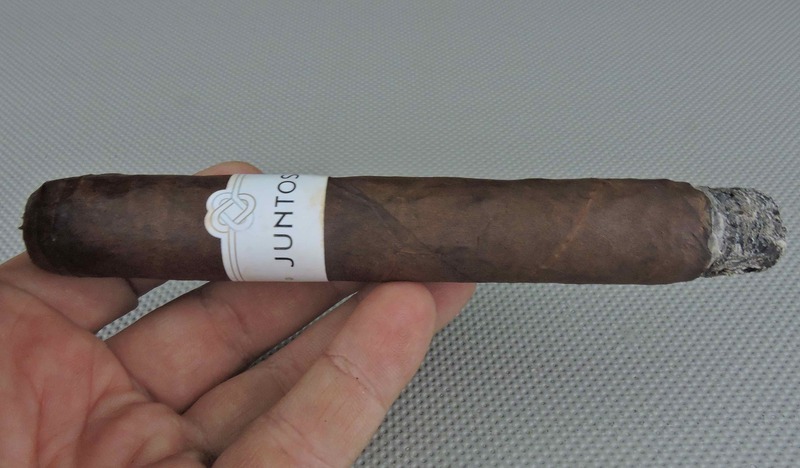 Without further ado, let’s take a closer look at Viaje Juntos 2018 Toro and see what this cigar brings to the table. The blend incorporates a Connecticut Broadleaf wrapper over Ecuadorian Sumatra for the binder and Nicaraguan fillers. Connecticut Broadleaf and Sumatra are tobaccos Perez-Carrillo Jr. has a strong reputation for working with. There are two sizes to the Viaje Juntos 2018 – a Torpedo and a Toro. 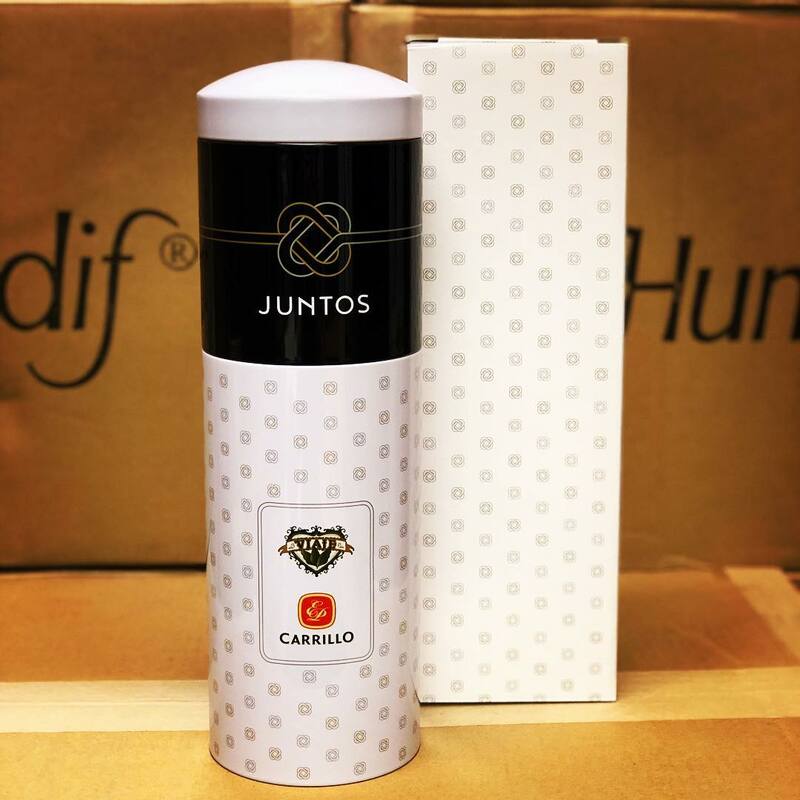 The packaging of the Viaje Juntos 2018 uses a very similar design introduced with the Juntos 2016. This packaging features two inter-locking cans. There are ten Torpedo cigars in the top can while there are ten torpedo cigars in the bottom can. The band for the Juntos 2018 Toro is very similar to the band used on the Juntos 2016 Toro. The band is white in color with the text “JUNTOS” in a simple black font. On the left side of the band is the text “VIAJE” and on the right side is the text “E.P. CARRILLO” – also black font. The far right has the text “2016” in landscape mode. There are two gold pinstripes on the upper left side of the band and two silver pinstripes on the upper right side of the band. The two pinstripes interlock at the center of the band like a pretzel. One side note: the torpedo vitola features a slightly different band design as it incorporates a black background with white font. The remainder of the band design is the same. The cigar experience of the Viaje Juntos 2018 Toro kicked off with a straight cut to remove the cap. After the cap was removed, it was time for the pre-light draw phase. The flavors delivered from the cold draw were simple, but quite enjoyable. The notes derived consisted mostly of cocoa and earth. There wasn’t much in the way of spice on the pre-light draw. Overall I considered this to be a very good pre-light draw. At this point it was time to light up the Juntos 2018 Toro and see what the smoking experience would have in store. The Viaje Juntos 2018 Toro kicked off with notes of earth, dried fruit, white pepper, and mineral notes. Early on the earth and dried fruit notes moved into the forefront. Meanwhile, the earth notes morphed into a creamy chocolate note early on. Throughout the first third the dried fruit notes transitioned several times back and forth from the forefront and background. The mineral and white pepper remained grounded in the background. It took a little while for the retro-hale to develop, but notes of black pepper surfaced. During the second third, the flavor profile of the first third continued into the second third. The one difference the creamy undertones of the chocolate subsided. But he midway point, the earthy notes resurfaced, this time along side the chocolate notes. The dried fruit remained secondary, the pepper notes increased, and the mineral notes dissipated. By the last third, there were notes of pepper, earth, and dried fruit all on par. The chocolate became a close secondary note. This is the way the Viaje Juntos 2018 Toro came to a close. The resulting nub was cool in temperature and slight soft to the touch. Overall the burn of the Viaje Juntos 2018 Toro performed exclellent. The burn of this cigar maintained a relatively straight burn path and relatively strain burn line. The resulting ash had a salt and pepper color skewered toward the darker side. This was an ash that was on the firmer side. Meanwhile the burn rate and burn temperature were both ideal. In terms of the draw of the Viaje Juntos 2018 Toro, I found this cigar to be somewhat on the open side. As a result of this cigar also produced an ample amount of smoke. While this was a cigar that was low maintenance in terms of deriving flavor, I felt I had to control the rate I smoked this cigar to prevent over-combustion. The Viaje Juntos 2018 Toro is a cigar that started out medium strength and medium to full-bodied. As the cigar experienced progressed both attributes did gradually increase in intensity. By the second half, the Juntos 2018 Toro had progressed to medium to full strength, and full-bodied. In terms of strength versus body, I found the body maintained the edge throughout the smoking experience. The term collaboration is one that has been overused in the cigar industry. While I would consider all of Viaje’s cigars collaborations, I do like the idea of having a co-branded series such as Juntos has done (i.e. with the E.P. Carrillo and Viaje names). When it comes to working with Connecticut Broadleaf in the Dominican Republic, Ernesto Perez-Carrillo Jr. is one of the best in that region of working with that wrapper. I wouldn’t consider the Juntos 2018 a radical departure from what he’s done, but it still has a lot of the quintessential Perez-Carrillo Broadleaf characteristics. At $16.00 per cigar, it’s a little high – and I’ll infer much of that is because of the packaging. At the same time’s a cigar I’d still recommend – particularly for the experienced cigar enthusiast desiring something on the fuller size. As for myself, it’s a cigar I’d smoke again -and would recommend buying for your humidor.